Often it is understood that black and white takes the vibrance out of things. How boring it would be to live in a monochromatic world ? How dull would be life without colours…. 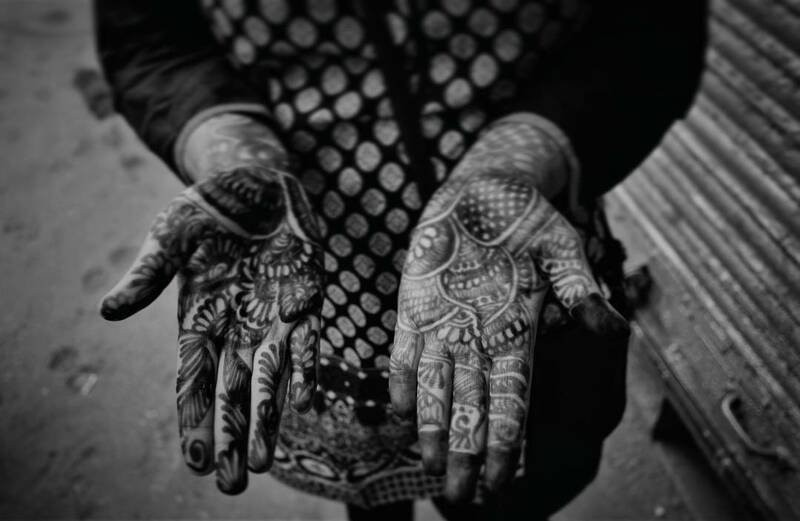 This is a picture of an indian woman wearing mehendi(henna) on her hands. Henna leaves a deep , rich maroon colour on the hands. Applying mehendi has been of cultural importance and is a part of Indian tradition. Mehendi , symbolically means beautification , growth, vibrance and fertility. It is a symbol of happiness and new beginnings. This black and white photo in fact, adds more depth to this concept. This colourless photograph highlights the journey of these women, their struggles, their strength, their wisdom and their beauty. It is truly amazing how nature changes everything, transforms everything, makes more beautiful. Took this shot on an early morning when I had woken up to the sound of rain. Yes, the sound of the raindrops splashing on my windowpane was nature’s way of waking me up. I went out in the balcony to see that my plants had really come alive. They looked so fresh and green. I closed my eyes, sat quietly for a while, hearing nature’s each and every sound, hearing the silence, hearing the noise. The luminous full moon shining bright upon Charminar. The Charminar is the landmark of the city of Hyderabad and is known for it’s architectural beauty. One of the first photos that I took. It is really interesting to note the calmness in the state of sleep and comfort. Liquor has been a major talking point in the political atmosphere in India since as long as one can recall. And more recently now, because of the approaching assembly elections in some Indian states. Although prohibition of sale of liquor is not a fresh topic of concern , it is quite clear that in most states , the agenda of the respective state political parties is centered around it. With most parties announcing to be in favour of the ban and citing it as a solid electoral agenda , all we can hear from them lately is poll promises, the fate of which is yet uncertain. While a few Indian states such as Gujarat , Nagaland , parts of Manipur , the Union Territory of Lakshadweep and more recently Bihar have categorically banned liquor, other states running for poles have pinned their hopes on the Liquor Ban . Most prominent are the states of Kerala and Tamil Nadu , in which parties have gone all clear in expressing their will to ban liquor if voted to power. If we look closely at the picture of Kerala ,where prohibition is being carried out in a phased manner since 2014, the government has confined liquor licenses to only the five star hotels in the state. Contrary to this move, toddy is still sold legally in the state which renders the ban of other alcohols ineffective since a major chunk of the liquor consuming population in the rural areas and a small fragment in urban areas consumes the palm wine. Besides, availability of liquor in local liquor shops has been reported in spite of the prevailing ban. In terms of the economic impact , close to Rs. 2500 Cr of state revenue will be lost every year due to the ban. The Muslim League and Kerala Congress have also joined in to show their support for the declaration by the current CM Oommen Chandy. A similar picture emerges in Tamil Nadu , where at a recent election campaign Jayalalithaa’s proposition to ban liquor after polls met with support from the masses, and predominantly from women. The political blame game was also witnessed when she blamed arch rival DMK of relaxing the ban in the past. The main target are the women electorates whom the parties are aiming to please through the proposed ban by citing their welfare. In most states the political parties are playing the liquor card to woo the voters. Whether these parties stick to their poll promises is still to be seen and the consequences are yet to come to the forefront. Though in Bihar, the CM Nitish Kumar has been very fast at implementing the complete ban with effect from 5th April 2016, it is too early to predict the out-turn . And perhaps the reason for such swift action by the Bihar government was to bring back its credibility to the picture and please the women electorate -by citing women empowerment and welfare- who voted in his favour in large numbers. He has also promised to set up anti-addiction centers and the entire affair at the annual revenue loss of Rs. 2000 Cr. Though the ban may see a strong support from the people and may prove to be a window to enhance the vote bank of the parties , it also imposes an additional responsibility on the government to ensure that there are no leakages in the system. The need for well formulated laws keeping in mind all the economic and social consequences become all the more important. For many communities , it is the main source economic activity and liquor is a thriving cottage industry in many states. In such cases, the government should also be well prepared to tackle the concerns of the people employed in these areas and ensure alternative opportunities. Apart from trying to manage the supply side factors of Alcohol, efforts must be made to tackle the demand for alcohol. In India , demand for alcohol is high among the youth which is due to social factors such as peer pressure, lack of public health awareness , unemployment and the likes which makes the situation appear grim. The policy initiatives to curb consumption of alcohol must be backed by spread of social awareness , de-addiction facilities and most importantly identifying and working on the causes for rise of alcoholism. The Government and the masses should together discern the need for working towards such a cause. Political parties highlighting such issues in the face of elections should not lose momentum after the polls and be persistent with such efforts after the verdict of the people has been declared. The true motive of the parties must not be limited to gathering votes but it must also extend to public welfare. Though, such initiatives portray the political parties in a positive light , the undercurrent of such promises are not unfathomable. Corporate Social Responsibility. We all have come across this word a number of times but haven’t really gone far to think about it. In simple words, CSR (also called corporate conscience, corporate citizenship or responsible business) is a form of corporate self-regulation integrated into a business model. But the question arises whether the companies are doing enough. There are many big entities who have been actively engaged in the CSR activities, but unfortunately the number is relatively less. In order to encourage more entities to participate in the process of development of the society via- CSR, the Government of India has actually implemented the concept of CSR in the new Companies Act 2013. What was supposed to be a “corporate self regulation” , a voluntary action has now become a mandated responsibility. When we look closely at the real picture , we notice that a company which is fair in its dealings with all it’s stakeholders need not extenuate about CSR. But if a company engages in questionable practices , this can’t be remedied by paying lip-service to CSR. Annual reports of listed companies have revealed that the companies with a questionable core business have devoted the most space to praising their CSR efforts. It is out of question, though , that companies which have taken such initiatives are better than the ones which have not. But is it an apt remedy ? Wouldn’t it be far better to discourage such businesses with a high social cost at the first place? For a company which exploits the society, will it be justified to later on provide sanitary facilities, build schools and parks ? Another aspect is that though large companies across the globe spend about a total of $20 billion dollars on CSR annually, the money, energy, and influence used to push popular CSR programs would be better spent either radically altering the way companies operate, or allowing better regulation—which would theoretically prevent companies from becoming being bad actors in the first place. Ideally, the government rules and regulations are enough to curb the malpractices of the corporations- be it in terms of environmental damage or labour abuses. But , the presence of such practices is evidence enough that such regulations are too weak. Corporates use the veil of CSR to their benefit. The research of relationship between CSR and consumer behaviour is relatively young, but it suggests that companies have already realised that their socially responsible behaviour has a direct impact on the consumer buying behaviour. It is used as a marketing tool to gain competitive advantage. This is because consumers are becoming increasingly aware of the companie’s practices due to the influence of media and better education. Infact, Fifty-five percent of global online consumers across 60 countries say they are willing to pay more for products and services provided by companies that are committed to positive social and environmental impact, according to a new study by Nielsen. Clearly, CSR has become an important criterion not only for corporate houses but also for the consumers and the society. Therefore, it becomes all the more important to understand the impact of CSR and also prompt the leading lights of corporate to take their social responsibility more seriously and do away with elevated social costs. Maybe it is in you….. I was listening to this mesmerizing sufi song by Tina Sani. These lines didn’t come to my mind before in the way they did today. Mori araj suno , listen to my plea. It was as if someone was calling me.. from an unknown and secluded place , far off from where I was. As I started walking back home from the metro station where I got down at 5:45 in the evening after a long day at college , I put on my earphones and this song started playing. This is one of my favourite songs , such a soulful track. And for the first time it meant something much more to me. It was like a call from my inner self , maybe from my mind , to listen to its plea , to listen to what it had to say . I always liked walking back from the metro station to my home . It takes me 15 minutes to reach. Those are the 15 minutes that I long for. Those 15 minutes of solitude. That is the only time in the entire day that I have to myself. The only time when I am alone. People who know me , know me as shy and introvert but a practical person. But inside my head, everyday there are conflicts which I am trying to deal with , confusions and even anger. There are times when I don’t know what to do or how to react and all I feel is melancholic. I don’t feel like talking to anyone and yet I want someone to understand me and talk to me. Sometimes it becomes too frustrating and all I want is to be left alone. I have read half way through the book Eat Pray Love as I write this and it has made me realise the importance of being at ease with one’s emotions and accepting oneself. It is a journey, a search for inner peace and calm. It emphasises on how important it is to spend time with oneself. And those 15 minutes do just the same for me. It is only today that I realised how well this regime of walking back home every day has helped me. Those are the perfect fifteen minutes. I enjoy each and every minute of the solitude. It has been a remedy . As I walk down the streets every day I see children playing , birds chirping and the pale leaves falling off the trees. And if lucky , I would even spot a peacock on some days. How quietly it allows me to absorb the beautiful surroundings, how intently it allows me to observe the people around me and how closely it allows me to reflect upon myself. I think of things that I don’t do otherwise while I am at home or at college. I get to concentrate on myself , it’s almost like meditation where I focus my energy and thoughts on one thing. It buys me an opportunity to introspect , to look back at the things I did and what I would want to do . For those 15 minutes my mind is calm. There are no conflicts . And somewhere amidst the hustle bustle of the street I come to peace with myself. Not only does the 15 minute walk refresh my mind but it also makes me immensely happy , the problems vanish and I find myself at peace. Everything just relaxes and eases out. I am able to attend to the calls and pleas of my inner self. Those fifteen minutes of solitude are what I yearn for throughout the day. It feels like a place where I belong. The sweet voice of the birds sounds like a homecoming song . These fifteen minutes feel like hours. And as I reach closer to my destination the chirping of the birds fades away. Time seems to be moving faster. I climb the stairs of my building and I am greeted by a cute kitten at the stairs . I press the doorbell and I can hear footsteps approaching. My mom opens the door. “How was your day ?” she asks. ” A walk to remember !” I say.